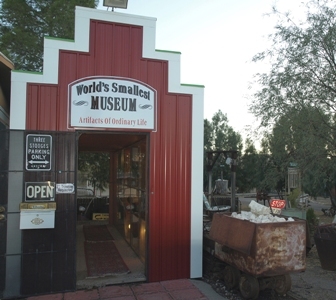 The World’s Smallest Museum showcases artifacts of ordinary life at an extraordinary roadside attraction. The museum is only 134 square feet and is subdivided into ten glass enclosed display booths, five on each side of the building. The west side of the World’s Smallest Museum roof is made out of 1800 aluminum beer cans. Its special attraction is the world’s largest Apache tear good luck stone. Found only in the Superior area, the Apache tear’s smoky brown hue is semi-transparent when polished. Legend says that the tears of Apache women who grieved for their warriors fell and froze in this obsidian stone. The Old West display includes photographs of the famous Apache medicine man, Geronimo, Mattie Blaylock (Wyatt Earp’s second wife), and the outlaw Ike Clanton. 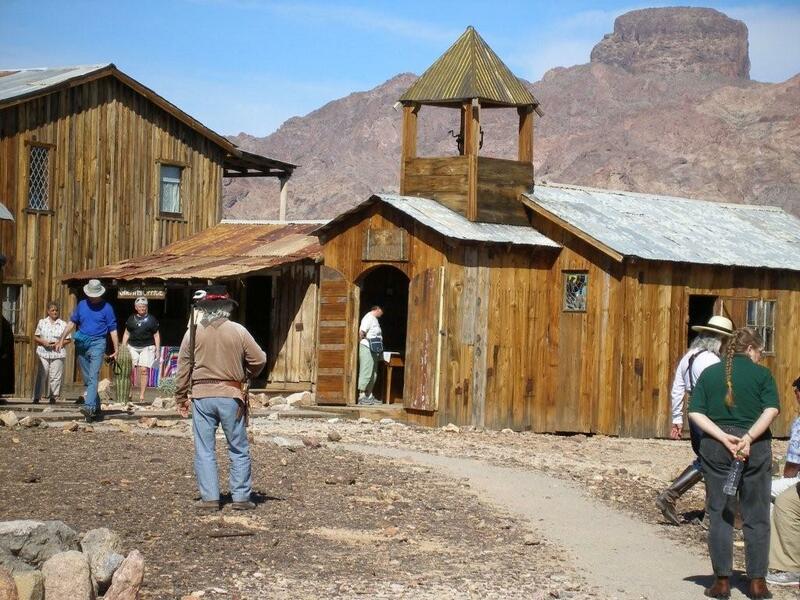 Here the visitor will find prehistoric Indian pottery shards, the story of the legendary Lost Dutchman gold mine and U.S. Cavalry artifacts. The Grandma’s Day displays features a washer, a gasoline powered iron, a washboard, a coal fired iron, an 1850s frying pan, a 1906 Pluto water bottle, buckets, a flat iron, an 1800s wood stove and an iron kettle filled with ancient pieces of pottery. The Movies and Film exhibits contain an 8mm movie camera, an autographed picture of Porky and Buckwheat from Our Gang, a 1974 photo of Oprah Winfrey, still cameras, local news clippings of the 1975 filming of Gauntlet starring Clint Eastwood, a 1930s 16mm projector and a NBC film bag, used by the network in the 1970s. From Quill Pen to the Information Age exhibits a 1917 Corona typewriter, assorted 1950s fountain pens and cartridges, ink wells, a quill pen, the world’s largest pieces of natural chalk, a 1984 Compaq Computer with 10MB of storage power and a 1960s copier with a can of original duplicator fluid. The Magma Mining Company exhibit contains old hard hats, bornite specimens, Magma’s local history and old mining journals, calcium carbonate specimens, mining bits, hard rock drills, carbide lanterns, a 1920s miner’s lunch box, an underground telephone and fire extinguisher materials. In Yesterday’s Kitchen, the visitor will find an early 1900s toaster, metal canisters, an Almond Joy candy box that could be bought with ten cents, a 1930s Sears pressure cooker with instruction book, an old Singer sewing machine, a 1950s popcorn popper, the largest fake Zippo lighter, a potato scale, an old milk bottle, soda bottles and a coffee maker. In the Politics, War and Local History exhibits the visitor will find campaign buttons for all the Democratic and Republican winners and losers in every presidential election since World War II along with Senators Barry Goldwater, Robert Kennedy and John McCain campaign memorabilia, The tourist will also find a photograph taken off the original Joe Rosenthal negative of the Marine flag raising at Iwo Jima and barbed wire from the World War II Japanese internment camp near Chandler, Arizona, and photographs of Arizona’s sixth governor, Governor Bob Jones who was also a pharmacist from Superior. The Local Mining and Surveying exhibits features the Silver King and Ray Mines with old surveying equipment. The Silver King pulled out more than forty tons of almost pure silver from 1885-1895. The Music & Stuff booth contains a 1960’s Beatles poster, old 45s and original songbooks. The framed horn entitled Mother’s Revenge was done by local artist Matt Moreno. Don’t miss the outdoor Memory Lane / Waterfall Avenue exhibit. The artist used artifacts of ordinary working equipment and recycled them into fountains and waterfalls. All this and a special parking space for the Three Stooges.